Arsenal beat Stoke 2-0 in a game that presented many opportunities that were bounced off goal posts, off the keeper’s gloves, and into the seats. Stoke City never looked to be in it, but to their credit they didn’t come just to defend. Arsenal managed to score both of our goals today, all by ourselves. Own Goal is now tied for most goals this season with an actual Arsenal striker, Olivier Giroud. Giroud started on the bench today, but after being literally booed off the field in his recent game with the French national team, he must have been relieved to have another goal. I’m getting a late start on my post because my husband took our son to his soccer practice this morning, missing the game. So that he could enjoy watching the game without knowing the result, I waited to post the Man of the Match that guides our Gooner Supper Club dish. Had a good bike ride on the Illinois Prairie Path so as not to inadvertently give it away by looking cheerful. Lovely day for a ride, with three points in my pocket. So many players did well today that we used the Arseblog ratings to settle Man of the Match, with the three-way tie broken by the Arseblog reader’s rating. Francis Coquelin put in a hard day defensively and offensively, with a beautiful tackle leading ultimately to the first Arsenal goal, put in the net by Theo Walcott. 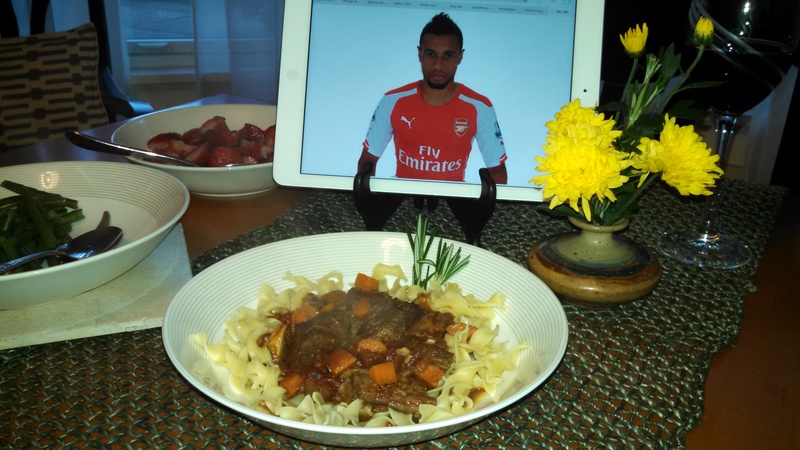 Coquelin is French, so we’ll have Beef Daube Provencal. The recipe is here. More match info and photos to follow. This recipe takes a long time in the oven, so must get to the grocery, pronto. Back again while the Beef Daube Provencal cooks. It smells delicious but has several hours to go. 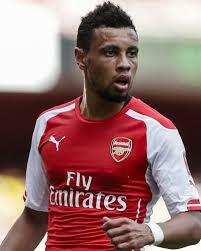 Francis Coquelin is a young player who had been at Arsenal since 2008. He found himself suddenly playing regularly last season after Arsene Wenger needed to call him back early from a loan to Charlton Athletic because of Arsenal’s ongoing injury crisis. Almost immediately, he made a positive impact in the team and has managed to hang on to his starting position even as the injury crisis abated. He was so good last season, many fans worried that it was a fluke. He didn’t start this season quite as strongly as last season, but he has been very, very solid. He’s seemingly removed some of the aggression that produced a worrisome number of foul and yellow card calls, while maintaining enough to be a force on the field. Coquelin was one of the guys who was not called to play with his national team during the international break, but that is certainly not likely to be true if he keeps producing performances like he did today. Click here to see the tackle he made that led to the first goal. Arsenal end the day in third place in the Premier League, tied with Manchester United on points, but behind on goal differential. Good progress in the right direction. Manchester City won again today and is solidly in first. Chelsea lost again. When they struggled so much at the beginning of the season, I wondered if Mourinho was intentionally putting the team at a disadvantage to influence transfers, but unless he is very dedicated to that ploy even after the transfer window is closed, it seems the wheels have fallen off completely. Will be back in a few hours with photos from Gooner Supper Club. The Beef Daube Provencal was delicious. I am a big fan of a meal that goes in the oven hours before you eat it. The effort is so far in the past by the time you eat it, you feel like someone else did the cooking. I am also now a fan of French players being the honoree at Gooner Supper Club. Olivier Giroud, Laurent Koscielny, it’s time to outshine some people, hear?